Assistant Professor, Department of East Asian Studies, Delhi University. US President Donald Trump is going to have a second meeting with North Korean leader Kim Jong-un in mid-February 2019. The core objective of this meeting is North Korea’s denuclearisation, which has remained elusive. Even though it is well-established that denuclearisation will not happen overnight, at least two short-term moves are instrumental to gauging whether the process is moving in the right direction. One, deliberation, and if possible, agreement, on the detailed trajectory of denuclearisation. 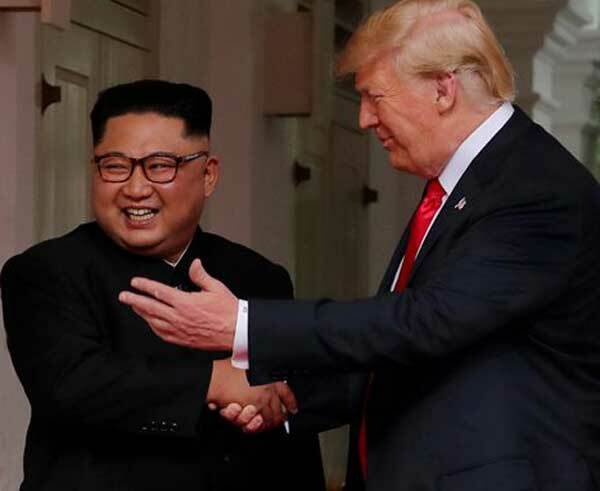 Two, incremental trust-building measures between the US and North Korea to help create an overall positive may produce positive bilateral environment for denuclearisation. Unfortunately, neither of these two things have happened after the much hyped first summit meet between Trump and Kim in June 2018 in Singapore. All the reported interactions between the US and North Korea after the first summit have been contentious, limited, and superficial. On a few occasions, representatives from both countries have openly expressed their dissatisfaction with each other. US and North Korean diplomatic signals in the recent past suggest that the trust quotient between them has, if not worsened, at least not improved. There is a bilateral deadlock, and if the current trend continues, it will be hard to expect much by way of substance – or anything at all – from the second meet. The much more significant development after the first summit meet is the growing closeness between North Korea and China. The Trump administration has rather unintentionally become instrumental in bringing North Korea and China closer. Top Chinese and North Korean leaders did not have any direct meetings after Kim Jong-un came to power in 2011, and there were very few high-level visits between the two countries in that period. However, the bilateral relationship has re-energised quickly in the past one year. Chinese President Xi Jinping and Kim have had four summit meetings in less than a year, and there are reports that Xi will soon make his first official visit to North Korea. China, too, has not been in favour of North Korea’s successive nuclear and missile tests given particularly the closing gap they have initiated between its borders and US defence preparedness. However, it has been unable to stop North Korea’s stubborn quest because of limited leverage as well as its equally important foreign policy goal of ensuring the North Korean regime’s survival. It is for this same reason that despite strains in the relationship when Kim Jong-un took over power, both countries avoided direct confrontation or a public spat. China welcomed the shift in North Korea’s approach when it agreed to talk denuclearisation with the US. Kim utilised this opportunity quite cleverly, and made a quiet visit to North Korea before his first summit meet with South Korean President Moon Jae-in. Afterwards, before any important meetings with South Korean or US leaders, Kim been consistent in first discussing issues with China. This is based on the knowledge that North Korea’s proximity to China gives him the required strategic depth and leverage. In this light, an interesting observation is that when the US acknowledged that there were “positive developments” regarding denuclearisation, China demanded a reciprocal easing of sanctions on North Korea. China’s demand was, in a way, an endorsement of North Korea’s position of seeking reciprocity in its dealings with the US. In contrast, the Trump administration has gradually drifted away from China both on the North Korean issue as also their own bilateral issues. Through the narrow lens of North Korea’s denuclearisation, it seems that the Trump administration has not achieved any substantial forward movement but has instead pushed its rivals – China and North Korea – closer to each other. Donald Trump appears to be more intent on managing news and opinion about himself rather than contending with the ground realities of its negotiations with North Korea. Further, Trump continues to believe, quite erroneously, that North Korea has come to the negotiating table because of the US policy of “maximum pressure,” not realising or acknowledging the significant work done by South Korea in this regard. The importance of trust-building, give-and-take and concessions, and long-term goal setting have not been paid any heed by the Trump administration. Perhaps the president does not realise that even if you are not able to make new friends, you must at least maintain old relationships, and work to not bring your rivals even closer.